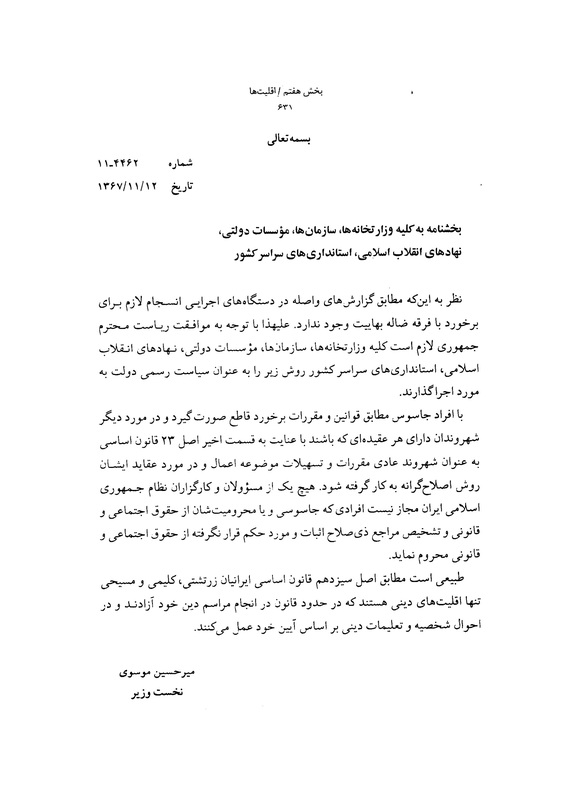 Referring to the reports received by the government concerning treatment of the followers of the Bahá’í Faith, Mir Hossein Mousavi, the Prime Minister at the time, addresses ministries and government institutions and Islamic Revolutionary agencies, declaring the following policy of the government that spies should be dealt with firmly according to the provision of the law. However, no government employee is permitted to treat anyone as a spy or deprive him/her of his/her social and legal rights, unless [such accusations are] confirmed by approved authorities. According to the reports received by the executive agencies, the mandatory consistency in dealing with the misguided sect of Bahaism does not exist. Therefore, with the president’s consent, the following official government policy is to be implemented by all ministries, agencies, government organizations, Institutions of the Islamic Republic and nationwide municipalities. The individuals who are spies must be dealt with decisively according to the laws and regulations. In dealing with other citizens with any beliefs, based on statuary provisions cited in the latter part of Article 23 of the constitution, they should be considered as ordinary citizens and a rehabilitation approach should be applied with regards to their beliefs. None of the officials of the Islamic Republic of Iran is allowed to deprive individuals from their social and civil rights before their charges of espionage or exclusion from social and civil rights are proven by competent authorities and a sentence is issued. Naturally, in accordance with Article 13 of the constitution, the Iranian Zoroastrians, Jews and Christians are the only official (recognized) religious minorities who, within the limits of the law, are free to practice their religion in terms of their personal conduct and religious teachings.